Waldorf Education meets the needs of children as whole human beings engaging hands, hearts and heads in appropriate ways at different ages. The Waldorf curriculum educates the HEART of the children so the HEAD will wake up to its full potential and direct DEEDS with sound judgement. Waldorf Schools honour and protect the wonder of childhood. They strive to provide a secure and nurturing environment for the child. A consistent philosophy of child development underlies the curriculum. Waldorf pupils develop an internal motivation for learning. Worldwide experience shows that a disproportionately high number of students gain access to Higher Education on leaving Waldorf Schools. In South Africa, there is widespread unemployment, poverty, substance abuse, crime and illness. The solution to many, if not all of these problems is education. 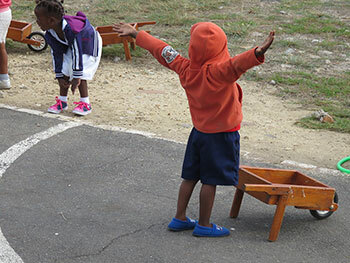 The Hermanus Waldorf School provides each child with an opportunity to reach his or her potential regardless of race, gender, religion or economic circumstance. The Waldorf curriculum aims to produce individuals who out of themselves are able to impart meaning to their lives. We teach in English, providing artistic and practical activities as well as academic subjects.